At 40 years of age this gorgeous, hugely perfumed Barsac, from arguably the appellation’s greatest estate, is fully mature but cruising along effortlessly, with the potential to reward at least another decade of cellaring, perhaps even more, given that a great Climens from a renowned vintage can deliver the goods for well over a half-century and often much longer. Château Climens dates back to at least 1547, the year its name first appeared on a real estate deed, and was first planted to vines at some point in the 1600s by the Roborel family. In 1855 the estate was purchased by the Gounouilhou family, who held onto the domaine, often producing some legendary wines, before Lucien Lurton acquired it in 1971 to bolster his growing Bordeaux empire. Lurton’s daughter, Bérénice, took over administration of the château in 1992 and since then, the already lofty reputation of Climens has climbed even higher. The Climens style favors balance and elegance over brute force but the wines in no way lack concentration or power, not to mention the capacity to age. 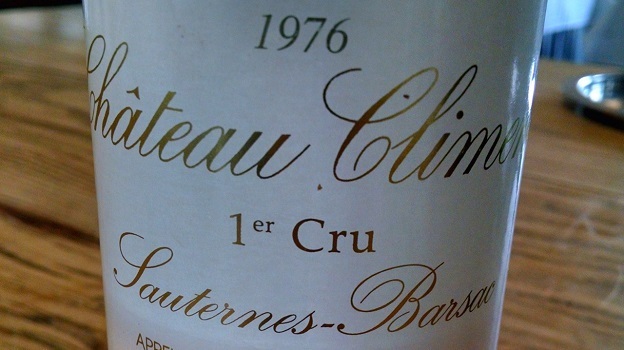 From one of the great vintages of recent decades, the 1976 (a hot year where the botrytis had a field day, or season) shows a color that suggests a far younger wine, with none of the incipient tawny or even brown hues that one would reasonably expect from a Barsac or Sauternes of such age. It displays a compelling bouquet of candied orange, apricot, mango, honey, brown butter and exotic flowers, with just a hint of caramel that is indicative of its true age. Rich and weighty but almost shockingly vibrant on the palate, the 1976 shows sappy, mineral-tinged citrus marmalade, pit fruit liqueur and buttery pastry flavors that completely coat the palate without coming off heavy or overly sweet. The finish, if one could call it that, is enlivened by a smoky mineral element that serves to impressively extend and brighten the wine’s rich, deeply concentrated fruit qualities. Straddling the fine line between indulgent and decadent, this utterly compelling Climens is fabulous on its own but it would really shine with a not-too-old, vaguely salty blue cheese of sheep origin, such as Roquefort or even a cow’s milk rendition such as Bleu d’Auvergne or Fourme d’Ambert. 95/Drink: 2016-2040.